The charge related to a separate incident at a republican Easter commemoration in Londonderry in April 2011 where Price was photographed holding up a statement for a masked man. Price, from Stockman's Avenue in west Belfast, was released on continuing bail, to be sentenced next month. Belfast Crown Court Judge Gordon Kerr QC told Price that the fact she was being released was no indication of how she would eventually be dealt with. 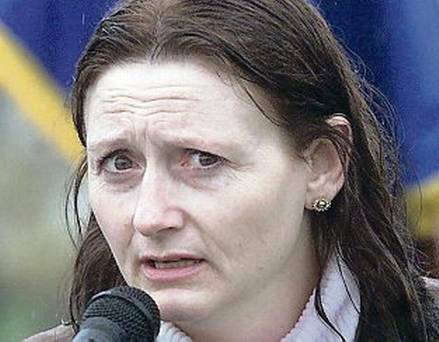 Price's trial, which began on Monday, heard that she had links to "dissident republican activity" and must have known that the mobile she bought was to be used to make the call claiming the attack on the Co Antrim base. Ms Kitson said that on March 8, 2009, a woman was caught on CCTV purchasing the pay-as-you-go mobile from the Tesco store in Newtownabbey. She said it was the Crown's case that the woman was Price. Price was questioned about the purchase of the phone but "declined to make any comment in relation to these circumstances and she didn't identify the person or persons to whom she must have passed this telephone to". Yesterday, unionists called on those who worked towards the release of Price to apologise and "admit they were wrong". DUP South Antrim MLA William McCrea said the SDLP needed "to find its moral compass". "This plea leaves the SDLP and other organisations that campaigned for her release hanging out to dry," he said. "Now the SDLP and others owe an apology to those they criticised and attacked, who acted rightly in the interests of public safety. It is time for the SDLP to find its moral compass again." Ulster Unionist MLA Danny Kinahan added: "I trust now that those who were crying the loudest about the 'injustice' of her having her licence revoked will have the good grace to apologise and admit they were wrong." However, SDLP justice spokesman Alban Maginness insisted his party position was "right at the time", adding it would repeat it in similar circumstances.